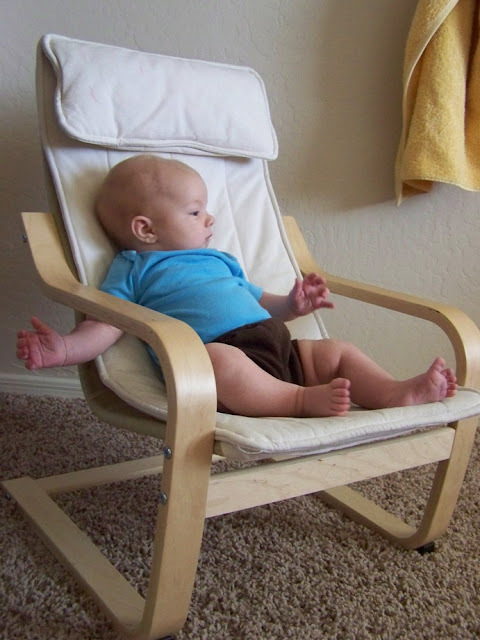 Mom, the Intern: 2 months. Can you believe The Smush is already 2 months old? Here he is in The Chair. 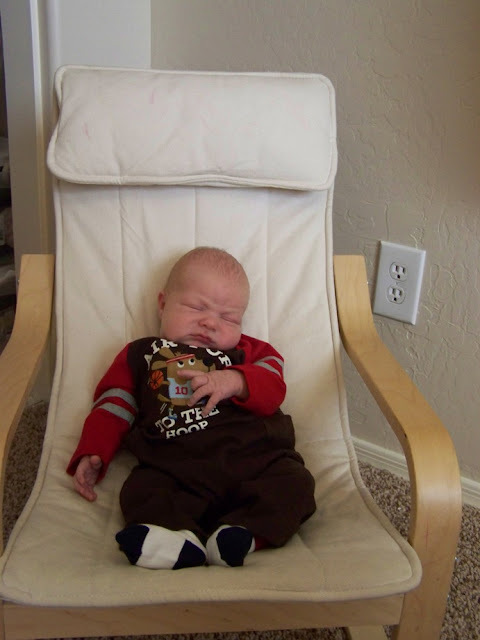 I've decided I am going to take a picture of him in this chair every month so we can better visualize his growth. Do you remember him in The Chair when he was a week old? He looked like one of those porcupuffers from Super Mario World. Yesterday was Smushie's 2-month appointment. Yikes. Five shots right in the chubby legs. I felt pretty bad, but it's important to me. I choose to vaccinate my children. I realize some people opt out or delay and that's fine by me, but I have no reason to. Smushie is a little piglet and weighs 13 pounds 1 oz. And he is now 24 inches long. Two whole feet! Ninetieth percentile, just like Bubs (a future basketball player if his dad has anything to say about it). And he's right on schedule as far as development goes -- smiling, cooing, doing the "mini push-up" and all that. And bless his little heart, he's sleeping through the night now, too! We're on a five-night streak so far. Last night, he went from 10 to 6:30. It was awesome. Of course, I woke up at 5 a.m. with rock-hard bazoombas and wanted to die, but at least he's not crying for food in the dead of night anymore! Eventually, the milk factory will figure it out and stop making quite so much. Bubsy is such a great big sister. She's getting more involved now that Smush responds to her. She thinks it's funny when he smiles at her or does the mini push-up. She likes to talk to him when he's in his crib; I've come out of many showers to find her standing on her step-stool, peering in at him while he wiggles around. Warms my little heart. P.S.- I'm getting a new haircut on Saturday. Shorter and edgier than ever! Tyra would be so proud. Pictures to come (assuming it turns out nice). He is a chunk! Funny how you can see his head almost reach the little pillow at the top of the chair.